Background: Propofol is often used for procedural sedation in children undergoing gastrointestinal endoscopy. Reliable assessment of the depth of hypnosis during the endoscopic procedure is challenging. Processed electroencephalography using the Narcotrend Index can help titrating propofol to a predefined sedation level. Aims: The aim of this trial was to investigate the impact of Narcotrend Index-guided titration of propofol delivery on the speed of recovery. Methods: Children, aged 12-17 years, undergoing gastrointestinal endoscopy under procedural sedation, had propofol delivered via target controlled infusion either based on Narcotrend Index guidance (group NI) or standard clinical parameters (group C). Sedation was augmented with remifentanil in both study groups. The primary endpoint of this study was to compare the speed of fulfilling discharge criteria from the operating room between study groups. Major secondary endpoints were propofol consumption, discharge readiness from the recovery room, hypnotic depth as measured by the Narcotrend Index, and adverse events. Results: Of the 40 children included, data were obtainable from 37. The time until discharge readiness from the operating room was shorter in group NI than in group C, with a difference between medians of 4.76 minutes [95%CI 2.6 to 7.4 minutes]. The same accounts for recovery room discharge times; difference between medians 4.03 minutes [95%CI 0.81 to 7.61 minutes]. 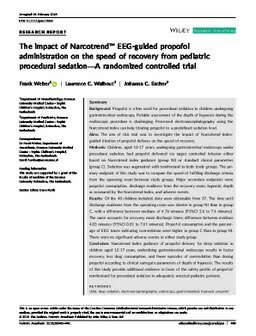 Propofol consumption and the percentage of EEG traces indicating oversedation were higher in group C than in group NI. There were no significant adverse events in either study group. Conclusion: Narcotrend Index guidance of propofol delivery for deep sedation in children aged 12-17 years, underdoing gastrointestinal endoscopy results in faster recovery, less drug consumption, and fewer episodes of oversedation than dosing propofol according to clinical surrogate parameters of depth of hypnosis. The results of this study provide additional evidence in favor of the safety profile of propofol/remifentanil for procedural sedation in adequately selected pediatric patients.